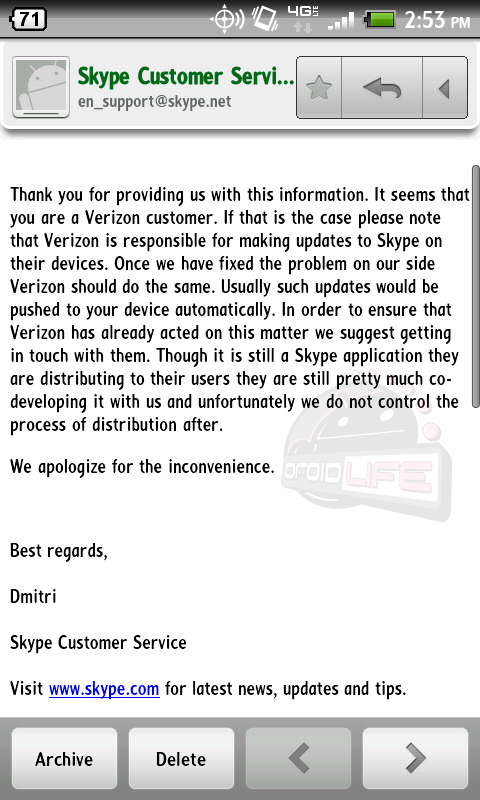 Skype with Video is Finished, We’re Just Waiting on Verizon to Release it? According to the email you are seeing above from a Skype CSR, that is most definitely the case. Skype creates and finishes the different versions of their apps and then Big Red gets to decide when they are released. Since they have a massive partnership that began last February, we shouldn’t be all that surprised by this, but we’re just wondering what the hold up is at this point. You may remember that Skype issued a vulnerability fix to their non-Verizon app last week, but we’ve been told that the version with video has also already been updated to patch any security holes. In fact, they have updated the app at least 5 times in the last month, which could mean that they are still tweaking things, but is also a pretty good sign that we should be getting close to a release.